Is your smile missing something? If injury or disease has caused you to lose a tooth, it can take a toll on your self-confidence. Not only can smiling be difficult, so can eating your favorite foods, meeting new people, or even attending social engagements. If you’ve been living with the embarrassment of an incomplete smile, talk to Dr. Murphy. Dental implants do require adequate bone mass and oral health prerequisites. A consultation and examination with Dr. Murphy will help determine if you’re a good candidate. Hearing the words “root canal” can strike fear into the heart of even the strongest individual. But honestly, it’s not as bad as you think. Root canals are a very conservative treatment for a tooth that might otherwise have to be extracted and then replaced with a prosthetic. And with today's advanced analgesics and technology, root canals are much more comfortable than they used to be. Your teeth are made of several layers including a protective outer layer, called enamel, a secondary layer of dentin, and an inner pulp that is commonly referred to as the tooth “nerve.” The pulp chambers of your tooth branch off forming canals that provide a means for the tooth to absorb what it needs and rid itself of toxins through the bloodstream. A deep cavity, injury, or fracture can introduce infection, killing the pulp and increasing blood flow to the tooth, creating painful pressure. If left untreated, chances are, you’ll lose your tooth. We simply clean out the diseased canal, fill it with a biologically inert substance, seal it from further infection, and you're on your way. Many times, we’re able to complete the treatment in a single appointment. You might notice slight swelling and tenderness after the procedure, but you’ll leave our office with instructions on how to ease discomfort with over-the-counter pain relief medications. We want you to keep your natural smile for as long as possible, and for that reason, if you’re experiencing tooth pain, don’t let it wait. Early diagnosis and treatment is your best bet to avoid more invasive treatments. Back in the day, silver or gold fillings were used. Now we know that Composite can be used, which is made of quartz resin, white and more natural looking. The fillings are used to fix teeth that have been damaged by decay and fractures. The impaired portion of the tooth will be removed and that portion will be replaced with composite filling. They are attractive since they match existing teeth and will last for years to come. 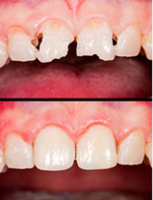 • Complete Denture - Loss of all teeth in an arch. • Partial Denture - Loss of several teeth in an arch. Dental technology is rapidly advancing, making many restorative dental procedures more comfortable and convenient. Metal-free dentistry is just one of the ways we provide state-of-the-art care. We use composite resins for tooth-colored fillings, as well as all-porcelain restorations so you can expect to have a lasting, beautiful smile.